There are a lot of stir fry cabbage subzi recipes but this cabbage subji, a Maharashtrian vegetable recipe, is simple and easy to make. Cabbage is called Gobi (Hindi), and Kobi (Marathi), Kosu (Kannada). Cabbage is cooked by itself or with lentils. Cabbage is also used to make paratha along with whole wheat flour.It is cooked along with rice and spices. It is good to add cabbage into your diet as it helps you reduce weight. Cabbage is one of the negative calorie food. Meaning that when you eat cabbage, the energy that you spend in digesting cabbage is more than what you are getting from that cabbage. So do not forget to add it to your meals regularly in soups, rice, subjis or in snack items. Don't know many recipes using cabbage? Keep reading and you will find recipes on this site. This one of the stir fry cabbage subzi. It is a good accompaniment with any Indian Bread, such as chapati or with plain rice. etc. Cabbage - 2 cups, chopped. 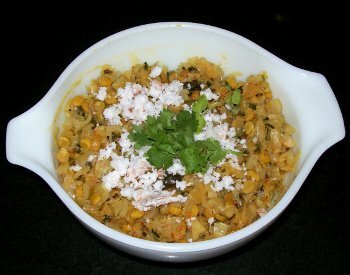 Chana dal(split chickpeas) - 1 tbsp . Green chillies - 1 or 2, Slit in two pieces . Heat oil in a pan. Keep heat medium. Add mustard and cumin seeds. When they stop spluttering, add Asafoetida (hing) and chana dal. Add green chilli pieces. Fry for 5 seconds. Add chopped cabbage. Mix and Cover. Reduce heat and cook for 5 minutes. Add ginger/garlic paste, curry leaves. stir.Add salt, sugar. Cover and cook on low flame till cabbage is just done. Add a little water only if needed to cook softer. Add chopped Coriander leaves(cilantro). Mix well. Keep covered till serving time. Garnish with freshly grated coconut and chopped dhania (cilantro) leaves when serving. Serve it hot or at room temperature with chapati or plain rice. You may add more chana dal if you wish. You may add red chili powder instead of green chilies. The color will change accordingly and you can see that in the image above. I like it more with red chili powder . There is no need to add water to this recipe. Cabbage contains enough water. When you add sugar and salt, this water will be released. That is enough for the cabbage and chana dal to be just cooked. If you like to cook it still softer, add 1 or 2 table spoons of water.To reduce final cooking time, you can steam chopped cabbage for 10 minutes before adding to seasoning. Or you can pressure cook cabbage and then add to the prepared seasoning and then stir fry. Cabbage salad - Raw cabbage salad. Curry recipes - Inidian Curry recipes. Lentil recipes - Lentil with vegetables, with rice. Bread recipes - Indian fry breads and flat breads. Rice Recipes - Indian Rice recipes.